Who is…Komninos? A submerging artist, at 63 years old the closest thing to a dead poet that Outer Urban Project’s Poetic License could get for their production based on Aristophane’s play ‘the frogs’. Dionysus travels to the underworld to find a dead poet, to bring back to life, to save Athens from it’s apathy. An Australian poet best known for his work with young people in schools. Australia Council’s Ros Bower Community Artist of the Year, 1992. What would you do differently to what you do now? Take public transport instead of driving a car. Wear a jumper instead of turning on a heater. Wait 24 hours before I post anything on Facebook. Who inspires you and why? Other poets inspire me, not the ones the publishers and university professors tell me are good poets but the poets I meet every Saturday at the Dan O’Connell Hotel in Carlton, at the bar or in the beer garden – they write from their experiences and their hearts. Younger writers inspire me too, they write from their innocent naivety. What would you do to make a difference in the world? I try to get rid of the fascist in me. The fascist in me makes me racist, makes me sexist, makes me selfish and cold hearted. I try to find areas of my life I could improve and how I can make life better for the people around me. I might not be able to change the world but I can change my world, to make it more equitable and fair. Favourite holiday destination and why? Phillip Island, Victoria – walks alond cold rugged wild windy coastline, penguins and open fires. When friends come to town, what attraction would you take then to, and why? Brunetti’s in Carlton. This place is a cultural phenomenon. Each weekend thousands of outer suburban Italo-Australians descend on Brunetti’s cake shop to remember what it was like to be Italian, they bring their wives their children their parents, the full catastrophe. Many other cultural groups visit Brunetti’s too, but it remains essentially Italian. What are you currently reading? A collection of photographs by Nick Walton-Healey called ‘land before lines’ a collection of 68 portraits of Melbourne poet’s with poems written by each writer. What are you currently listening to? 1278 magic AM, old people’s radio, a careful blend of nostalgia from the 50s and 60s and funeral insurance ads. Happiness is? Finishing a poem and really liking what I have produced. Taking that poem to an audience and seeing if they like it too. What does the future hold for you? Hopefully spending more time in the present and not dwelling too much in the past. Finding new things to interest and motivate my creativity. Finding ways to live more sustainably. Possibly love. In practical terms more involvement with the projects of Outer Urban Projects where I offer a mentoring and educational input. Komninos is a Greek Australian poet and spoken word artist and has a Masters of Arts in Creative Writing from Queensland University. His published poems and word plays are delicate, political and powerful and include: The Baby Rap and Other Poems; High Street Kew East; his poems from Komninos by the Kupful are on the year twelve Standard English curriculum. He established a web presence in 1996 when writer in residence at the Queensland University of Technologies Centre for Innovation in the Arts, and has been writer in residence at ARTEC – a multimedia training and resource centre in Islington where he authored a CD-ROM, Cyberpoetry underground which was runner-up in the Electronic Literature Organisation’s Award in poetry, and Artist in Residence at the State Library of Victoria. 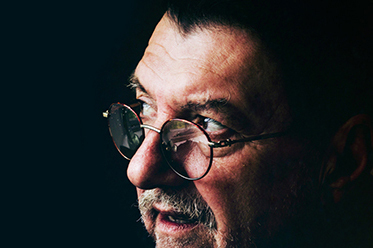 Komninos was the recipient of the 1991 Human Rights Commission award for Literature in New South Wales, and the 1992 Ros Bower Community Artist of the Year for his work in schools and the community. He is currently a writing mentor for Outer Urban Productions, in addition to plus performing at writing/performance venues around Melbourne. Komninos is currently performing in Poetic License for Outer Urban Projects as part of the Melbourne Writers Festival (27 – 29 August). For more information, visit: www.outerurbanprojects.org for details.